If you have two identical but oppositely wound inductors does the inductance effectively cancel? I was just curious if the effect inductance of a branch of a circuit would cancel if you put two identical but oppositely wound inductors in series. It's not something I have come across.But looking at the change in signs I imagine this to be the case. Someone mentioned it to me regarding wound resistors in a circuits, and splitting them into 2 resistors in series, with opposite winding to reduce/attempt to cancel the inductance. I have also recently needed to place several surface mount inductors in series, and I have no way of identifying which end is which, or the winding directions. They are not all the same make or model.And I have had difficulty measuring their inductance. It depends of the extent of their mutual inductance. Roughly speaking, if they are wound on the same ferrite core, they have a large proportion of their inductance that is mutual (as in a transformer for instance), so they would mostly cancel. If, as it seems to be in your case, they are separate components, they are wound on separate cores and have little mutual inductance. In case of air inductors or resistors as mentioned, the distance between them and exact geometry has to be taken into account and only an electromagnetic simulation software can tell how much is canceled, but that would be much less than a complete cancellation. If you put two inductors in series with a common axis, there will be little cancellation. If the two were put into close proximity side-by-side you'd get more, but probably not much. It is possible to get non-inductive wire-wound power resistors. These essentially take a single conductor, fold it in half, then wind the resulting doubled wire on a core (not a magnetic core). Because the halves are physically close, the voltage rating of the resulting resistor is less than with normal construction (winding the wire on a core), but the inductance is much less. Mutual inductance is always less than the sum of the inductance. 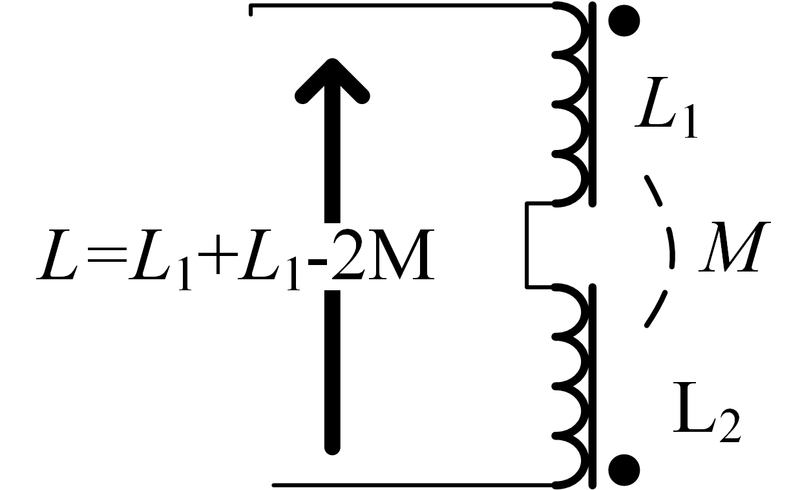 When two inductances are identical (L1=L2=L) and perfectly coupled (M=L), then it will be completely cancelled but I don't think it happens in reality. Not the answer you're looking for? Browse other questions tagged inductor inductance induction winding or ask your own question. What does the “L” in inductance stand for? Why do opposing magnetic fields in the same core cause the core to heat up? Why don't Inductors have voltage ratings, but transformers do? Old Inductor, replace with newer current-production? What happens if I parallel two somewhat different size transformer primaries?